If you hunt long enough you’re bound to witness a “Hand of God” experience. Until recently that was something I’d only heard about from others. I have a friend who is a state ambassador for the “Hunt of a Lifetime” organization in Idaho. It’s a non-profit that provides hunting and fishing dreams to young people with life-threatening illnesses or injuries. Recently he shared a story with me about a little boy with a terminal illness who came to Idaho to hunt mule deer. Weighing a little over thirty pounds, he was so small he couldn’t lift the rifle on his own. Needless to say the “Hunt of a Lifetime” team headed out in search of a trophy buck for the young boy. It was a foggy morning as they drove along a desert dirt road, just south of Bellevue. But, with limited visibility they pressed on, and in an instant the fog cleared. That’s when they saw a monster muley buck standing broadside in the sage brush not far from the truck. The little boy, with the help of the HOL team, got his rifle into position and fired while one of the crew helped him steady the gun. It was a miss… but to the total disbelief of everyone in the truck the buck continued to stand there broadside. Meanwhile, the little boy fired three or four more shots before he finally hit the buck. The buck never moved. 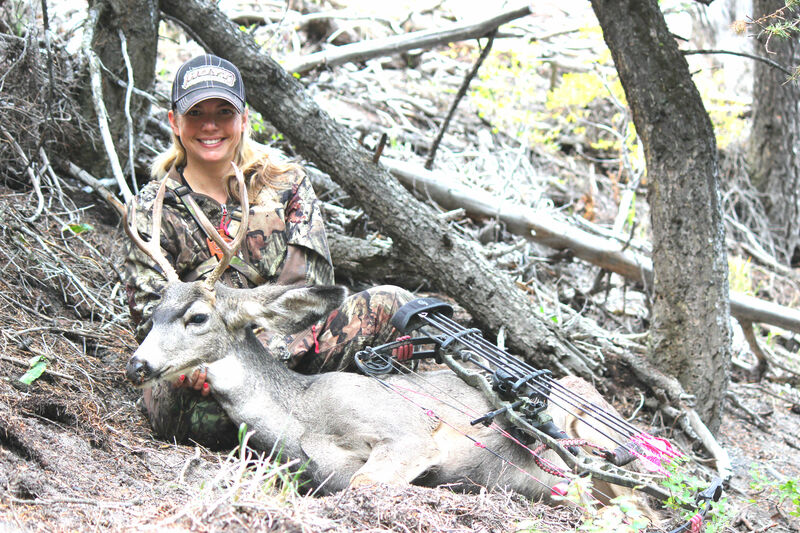 This September I set out to kill my first archery mule deer. My hunting season started a little rocky. The weekend before my deer hunt I spent four days hunting antelope in the desert southwest of Twin Falls, Idaho. Just about everything that could go wrong did. Somehow my antelope tag had fallen out of my tag holder and when I got stopped by the game warden I didn’t have it on me.I was beyond scared. I thought for sure I would lose my hunting privileges. Thanks to technology she could see that I had bought a tag. But, I still ended up with a written warning. A few days later I headed out again… this time I made absolutely sure I had my tag in hand. My father and I were headed to a water hole where I had seen a nice buck and several does frequenting. We were half way to the hole when my Dad asked if I had the keys to the truck. I didn’t… I’d locked them inside the truck along with my cell phone and purse. We were stranded in the middle of nowhere with no way to contact home. Thankfully, two traveling musicians happened to be coming down the road and were gracious enough to give us a ride to the nearest town… 20 miles away. I had never had such bad luck in all my life. The final straw was on day four when on a perfectly calm, windless day, not characteristic of the desert area at all, a burst of wind, we call them dust devils, literally dropped on top of our ground blind and launched it twenty feet into the air while we were sitting inside. The wind then carried another roughly 300 yards across the flats before it came to rest. Broken and defeated I headed home and decided it was just not meant to be. Now, with all that happened I would like to say I remained positive and kept my faith… but I didn’t. I was brokenhearted and ready to quit. It was my husband that literally forced me out the door the next day on our long-awaited elk/mule deer hunt. With the way my luck had been going I made the decision to shoot either a buck or a doe with my bow. Whichever God provided, I would shoot. The first evening, right at dark, two does stood broadside at 20 yards. I pulled up, my husband ranged one, and I let my arrow fly. I missed.The shot felt funny, like I wasn’t at full draw. It turns out I wasn’t. The back pack I was wearing kept me from getting there. It was at this point I realized God obviously had something else planned for me. I don’t ever miss at 20 yards. The next morning we were back at it at day break. My husband and I decided to cruise up the bottoms of the canyon. We came to the top of the first hill. He killed the motor on the quad and threw it into neutral so we could coast down. We were about half way down when he stopped and said he wanted to glass the hillside to our left. Meanwhile, I turned to the hillside on the right and standing there about 150 yards away was a little 3×3 buck. My husband and I sat there as still as possible watching the buck work it’s way toward us. We weren’t really sure what to do. There was no cover anywhere and if we moved he would surely see us. So we just sat there and watched from the middle of the road. The buck looked up at us… stared for a few seconds and went back to eating. Not a care in the world. We couldn’t believe it! Then, what’s more he started walking straight across the hill at us. He’d walk, look up, occasionally at us… and then go back to eating. All the while my husbands ranging him. 76…65…53… he whispered. “You need to get off the quad or you’re going to miss your opportunity,” he said. “Just wait,” I said “not yet.” I wanted to get him within 40 yards. I’m accurate nearly 100% of the time at 40. “Forty-five,” he said with urgency in his voice. “That’ll work,” I thought. I got off the quad and started knocking my bow. I fired and missed shooting right under him. Apparently while I was getting my arrow ready he moved out to 50 so I shot right under him. He took off at a trot across the side of the hill. He ran about 20 yards.. stopped broadside on the hill, turned again, and stared at us. “Forty,” my husband said. I knocked an arrow, pulled back, let out a breathe of air and fired. It was a clean hit. A little farther back than I would’ve liked, but still in the vitals. Eight drops of blood is all we ever found. The arrow went in one side and out the other. We found it about 100 yards from where I shot him. Right around the same time I heard a huge crash in the brush below. That was the last physical sign we found. We spent an hour looking for blood. Having no luck we decided to leave for a bit and come back, so we didn’t push him.